Map Showing the different routes travelled over by the Detachments of the overland Command in the Spring of 1855 from Salt Lake City, Utah to the Bay of San Francisco. This is a beautiful example of the 1855 War Department map of Salt Lake City, Utah to San Francisco Bay, California. 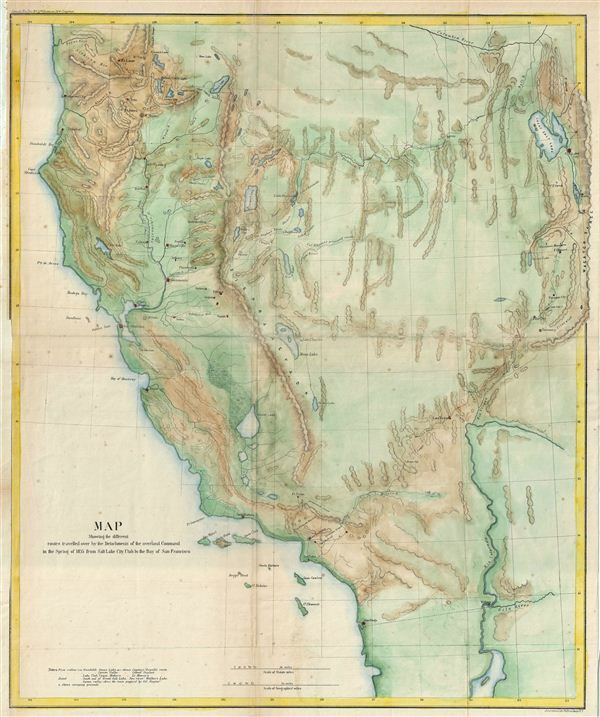 The map covers the Great Basin to illustrate the routes traveled by Colonel e. J. Steptoe, Captain Rufus Ingalls and Lieutenant Sylvester Mowry from Utah to California in order to find a new and shorter route from the Great Salt Lake to the Pacific Coast. It covers all of California from San Diego to the Siskiyou Mountains and from Pacific Coast east as far as the Wasatch Range and the Great Salt Lake. Several forts, lakes, rivers, cities, creeks, mountains and various other topographical details are marked. The routes by the tree detachments, led by Steptoe, Ingalls and Mowry and camping grounds are noted. engraved by Ackerman of 379, Broadway, New York. Very good. Original fold lines visible. Left margin extended. Typical wear along folds. Professionally flattened and backed with archival tissue. Wagner, H., and Camp, C. L., The Plains & the Rockies: A Critical Bibliography of Exploration, Adventure, and Travel in the American West, 1800-1865, 256. Wheat, Carl Irving, Mapping of the Transmississippi West, 1540-1861, 868.